Sheet2Site is a tool that will help you create a beautiful website from Google Sheets with pictures, text, filters and links. Make a website without writing code from just one Google Sheet. Each Sheet2Site website consists of a Google Sheet with all the content and settings included. The website will update automatically if there are any changes made to the sheet. Description - detailed info about card. Text or number. 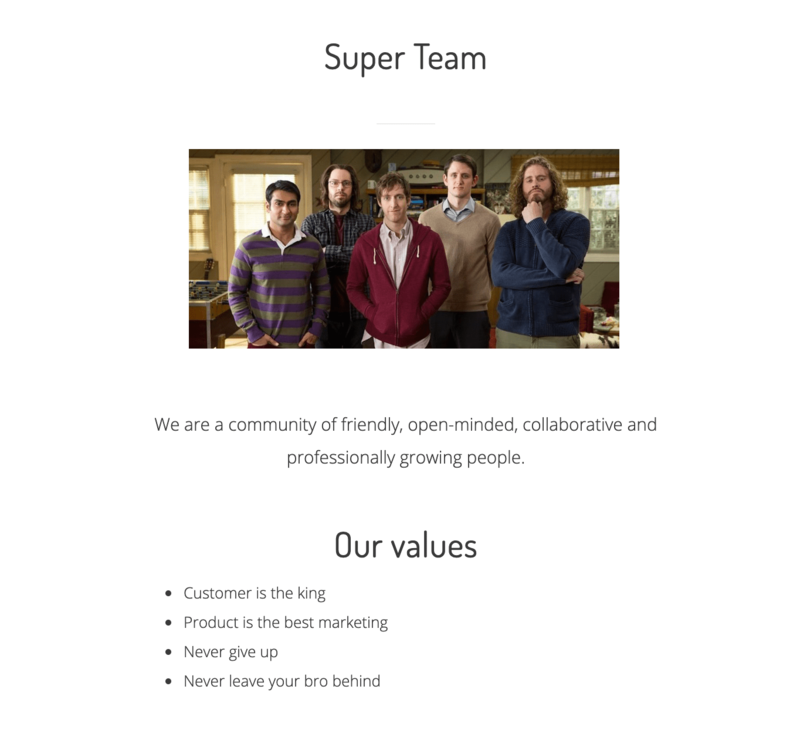 Think about the customization of your website as Lego blocks. You can select different headers, cards, maps, text section that can be combined with each other, rather than standalone templates that are not editible. I have built templates from these blocks, showing what you can build with Sheet2Site like Real-Estate, Events, Jobboard, Affiliate. But please don't be limited only to these kind of websites. Feel free to create anything that you want. Can I change a template? Yes. You can switch between templates in the Design tab. Just change Header Template and Card Template and you will have a different template style. All templates can support a switch to another template, so you don’t need to start from scratch each time. Another cool thing that Unsplash support image editing on the fly by adding special parametrs into URL, so you don't need to use any software to edit your image. &blur=80: apply 80% blur effect to the image. undRaw is a open-source illustrations for every project you can imagine. You can even customize a color of your illustration. ImgBB is a free hosting that you can upload your image and use on your website. You can find a lot of cool colors here. Click on the color palette you like and copy a specific hex color. Header: <h2>This is big header</h2>. Paragraph of text: <p>This a paragraph of text. Add more.</p>. Line break <br> you can add extra space between texts or images. 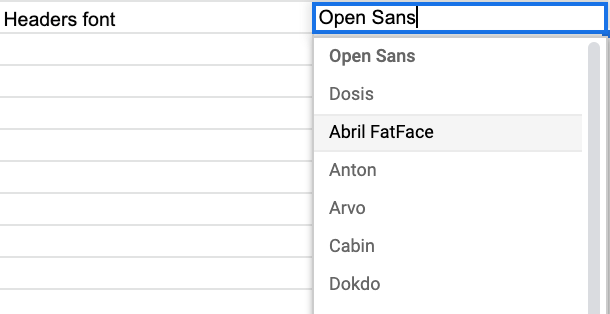 Now you can change default font to one of 22 avalible fonts. Open design tab -> Header font -> select from dropdown. Users can filter your items (cards) based on a single condition. Let's say you have a list of cities for travel and you want filter cities that have people or cars. Add filter button names only unique. In the filtering by this column add filters with the same names like you named filters buttons in the previous steps, but comma separated like AC, Sockets, 10 MB Wi-Fi for each item. You can try to use spaces in filter names but better not use it. You can add more links/a call-to-action button in the navigation bar in the top. You need to specify whether it is a link or button. If you want to add the link to external website, for example PayPal or any other that is not Sheet2Site please insert "-" (a dash symbol) in Subpage Sheet2Site website URL and do NOT leave it empty. The best way to know if people like your product is they're actually pay for it. Here are some ways how you can charge your clinets. You can add them as call to action button link. PayPal button is probably the easiest way to get money. You can create a simple link with your name and the amount of money. Example: https://www.paypal.me/andreyazimovpay/9.99usd. With Gumroad you can withdraw money to PayPal. To start using Gumroad please register there and add a product and a price. Please read their official documentation about getting paid and other details. 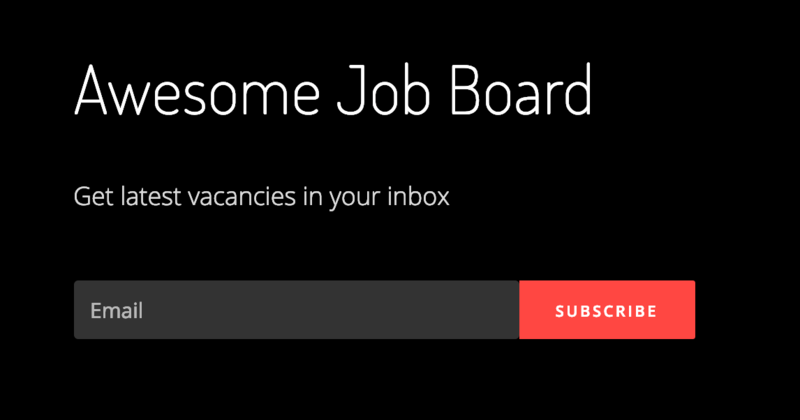 Once you connect your custom domain or subdomain you can add more subpages like example.com/about, example.com/jobs that are all linked in the navbar that allows users to navigate through all of them. There is a maximum of 10 subpages allowed per website. Type. Example: link. You can choose: link, button, detailed. 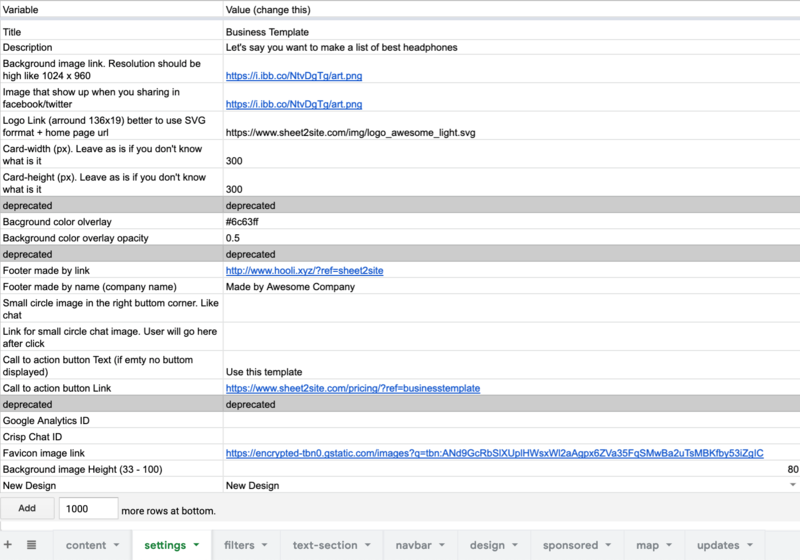 Navbar content should be the same in each Google Sheet to be able to have save navigation for all webiste, so please copy it in each sheet. For SEO is important to not just have a one page website. Google likes websites with more pages and good content. To be able to do it, you can create more pages which will show detailed information about an item (goods, vacancy, event, etc). These detailed pages are not shown in the navbar and you can have unlimited ammount of such pages. Subpage name: -. Just a dash symbol. Don't leave it empty. Type: detailed. Will NOT be shown in the navbar. To integrate Mailchimp to your Sheet2Site website you need to get the Mailchimp subscribe url. You can add embeded Google Form to your website to be able to collect data from users. 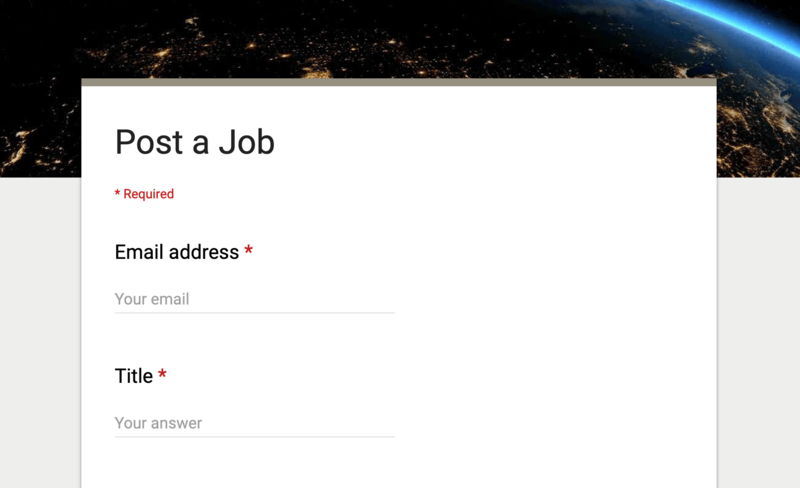 For example you want to make a post a job form for your vacancy website. 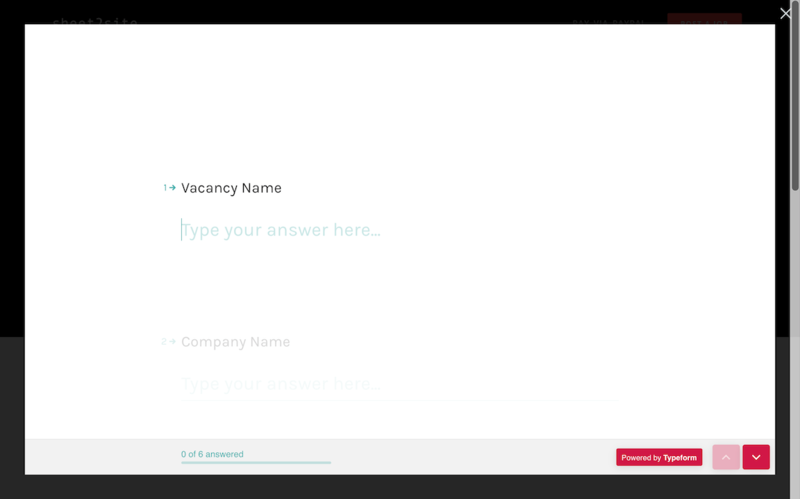 This form will be in your domain subpage like example.com/post-job. where &entry.866939081= is your filed and id-123456 is a pre-filled value. To know when some will submit the form you can active email notifications, otherwise you will need to open this form regulary to check if someone submit it or no. Open your Google Sheet. Main-tab page. To be able to aconnect Google Analytics to your website you need to setup a property and get a Get Tracking ID. Please check official documentation. Sheet2Site allows you to see the stat of most clicked links from your website via Google Analytics. 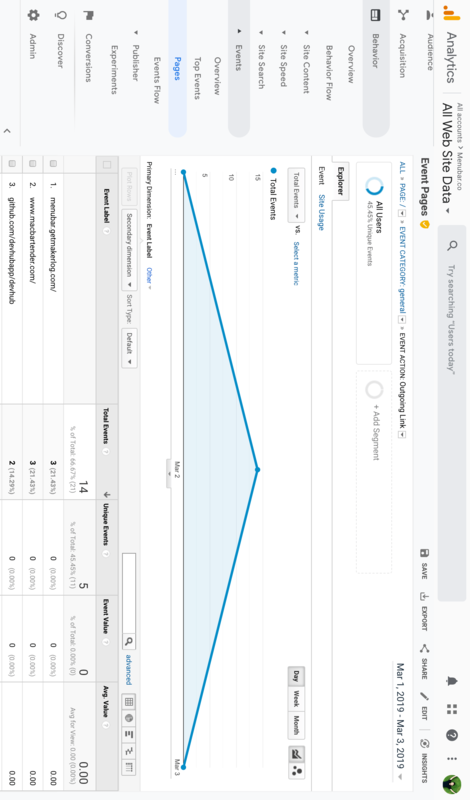 After you setup Google Analytics open your website and click on some of your links (maybe 10-20). Data should updated in 30 mins or less. You should see in your GA dashboard of links where clicks were performed. To add a map please go to the map tab in your Google Sheet and switch state to ON. A lot of good structured data is available through APIs like weather, ratings, currency rates and many more. APIs give you this data in JSON format and now it's possible to import JSON data directly into Google Sheet. More information how to use it here. Thanks to @bradjasper who created it. What is Basic / Premium? 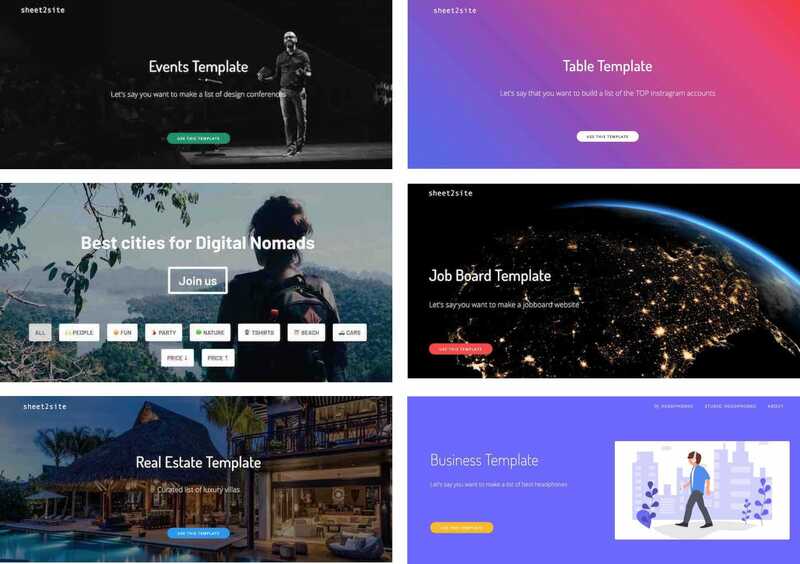 Brand new template design - customized specifically for your business like affiliate, job board, real estate, cafes, events, etc. The only difference is that Premium account allows to create 3 sites connected to 3 custom domains, while Pro only 1 website connected to 1 custom domain. Custom domains are addresses (links) like example.com of your website that allows people to find and remember your website in the internet. By default all website that are created has links like this: https://www.sheet2site.com/api/v2/index.php?key=1MG-aOEsc5wQoXVTnG9iilV6VRzgqMzmWpKYtTOKy1la which doesn't looks not really good. Basic and Premium plans allows you to use Sheet2Site websites on your own custom domains without Sheet2Site branding. How do I connect my custom domain? Please send me a screenshot once you are finished. Connecting custom domain may take up to 24h but usually faster. Please be patient. I will message you after domain will be connected. Sometime Host also called Name. It's the same. Do I need to buy custom domain? Yes, you do. You can register domains on namecheap or on anyother domain provider. .com domains are generally cheap and cost like $11 / year. 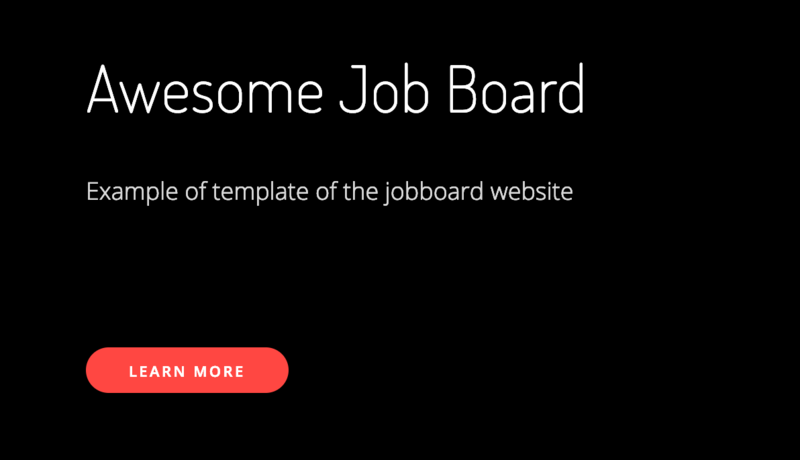 You can connect your subdomain like jobs.example.com and you can still keep your current home page example.com that will work independently. Can't find information / confused?